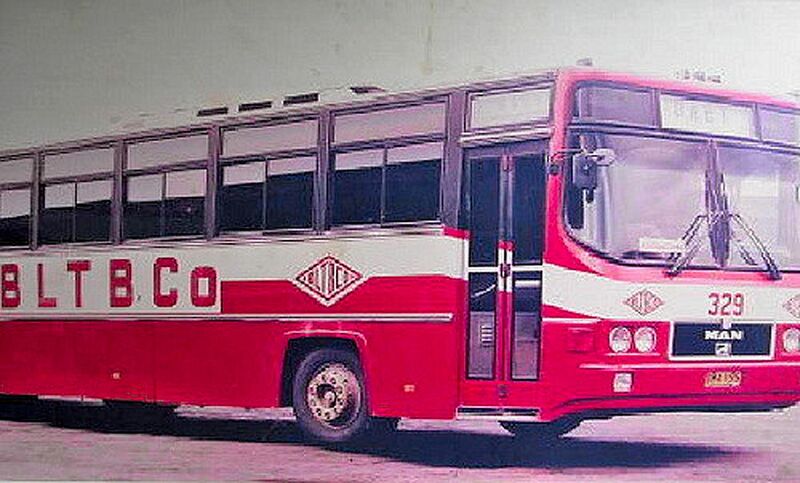 Readers who are old enough to remember when buses of the Batangas Laguna Tayabas Bus Company (BLTBCo) ruled the roads of the province in their distinctive red color and iconic diamond logo as well as those who regularly traveled to Manila will also recall a teeny bit of curiosity about the company. In Batangas, the buses or the company that operated these were generally referred to simply as BTCo. In Manila, however, if you told the taxi driver or the bus conductor that you were headed for the Pasay station of the BTCo, you would have drawn a blank stare. There, the very same company was known by a different acronym: LTB. To understand why this was so, we take a look at the company’s history. In 19171, a Spanish-American War2 veteran by the name of Max Blouse, who must have fought on with the United States Army Volunteers through to the Philippine-American War and stayed in Batangas, went into the transportation business and founded the Batangas Transportation Company. The company’s name was shortened to BTCo, which was also how it was known in Batangas. The company started with one bus described as having “calesa-like (a calesa being a horse-drawn carriage) tires with wooden spokes.” Blouse himself was “driver, conductor and repairman” when the company first started operating. The company presumably being a success, Blouse would soon build the company fleet up to eighteen auto-trucks, as these vehicles were known. By the 1920s, the company operated what would in the present day be considered “short” routes such as Batangas-Lipa, Mabini-Bauan, Bauan-Batangas, San Luis-San Nicolas, Mabini-Tiaong and others3. These routes were the sort that, in the present day, have been taken over mostly by jeepney operators. Of course, back in the day, the vehicles used would have paled in comparison even to today’s jeepneys. Encouraged by the success of BTCo’s operations in Batangas, Blouse expanded and formed another company intended to serve the provinces of Laguna and Tayabas, known in the present day as the Province of Quezon. The new company was named the Laguna Tayabas Bus Company. It would become known popularly as LTB. The onset of World War II in the Philippines late in 1942 meant that both BTCo and LTB would cease operations, with company-owned buildings and likely even vehicles destroyed during the war. By May 1945, incidentally almost immediately after the Americans had completed the liberation of Batangas from Japanese control, the two companies went back into business. Blouse contrived to acquire 28 buses from the United States Army under the Joint Emergency Operations Agreement. Blouse would die in December 1961. His place as president of the two companies would be taken over by his son-in-law Colonel Pelagio G. Potenciano. Under Potenciano’s presidency, in 1964 BTCo and LTB were merged to become the Batangas Laguna Tayabas Bus Company or the BLTBCo as some readers probably recall the company. To get back to the crux of the matter, the unified bus company continued to be called BTCo in Batangas even after the merger probably because it was always known as such from the time of the company’s foundation in 1917 to the merger in 1964, a total of 47 years. Meanwhile, probably because the Laguna Tayabas Bus Company’s operations were initially concentrated in the Province of Laguna, which is closer to Manila, LTB was likely known to inhabitants of the capital before BTCo was. It is also possible, albeit I am unable to locate corroborating information over the Internet, that LTB began servicing routes to Manila ahead of BTCo. In the present day, BLTBCo is known as the Del Monte Land Transport Bus Company (DLTBCo), after its acquisition by Del Monte Motor Works, Incorporated in 2010. 1 A Wikipedia article on “DLTBCo” places the foundation of BTCo at the year 1918 instead of 1917. Other bits of information contained in this article have been taken from this same Wikipedia item. 2 “Land transportation: proceedings of the First Institute on Transportation, 1980,” published 1982 by the University of the Philippines Law Center, online at Google Books. 3 “Batangas Transportation Company and Eliseo Silva versus Orlanes and Banaag Transportation Company,” online at Chan Robles Virtual Law Library.